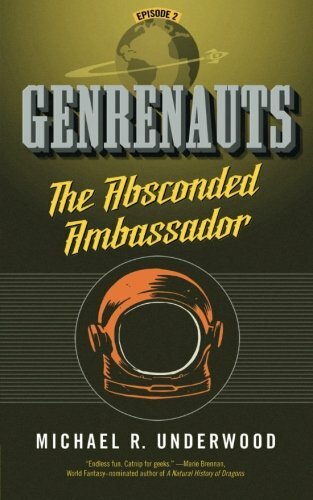 If the revival of short-form fiction brings us more fun books like The Absconded Ambassador, it will have been worth it. Book two in the Genrenauts novella series takes a team of specially trained fiction-fixers into a science fiction world. The key diplomat in an interstellar treaty has been kidnapped, endangering not only the story of the negotiations, but also things in our world that are thematically linked to the science fictional reality—real-world space travel and technology in this case. The novella isn't long at just 166 pages, but it tells as much story as a really good episode of Star Trek or Battlestar Galactica—and even makes a point of talking about the similarities. The Absconded Ambassador is a fun book, both lovingly sticking within genre conventions and making fun of the stereotypes those conventions breed. There's enough metafiction in the characters' discussions to generate a paper on science fiction, but it's handled very cheerfully. For the truly deep fans of the genre, it should be entertaining and sly, though it does sometimes drift into self-indulgence. The world we're introduced to would have been big enough for a full length novel, and the lack of pages does sometimes make the world-building and characterization feel a little skimmed over—there are a lot of alien species and cultures that are barely fleshed out, for example—and that's a shame. At the same time, since it's so obviously playing with set pieces and cliches, it's easy to forgive. If you've seen science fiction television or read a few books, you can fill in the gaps. If the series continues long enough, it would be interesting for the story to loop back around to the scifi world and check in with these aliens again later. Reading more “episodes” would also expand on the characters the way watching more of a show does, each piece of the story adding to the pool of characterization and plot-building. The Absconded Ambassador is not world-changing, but it's a heck of a lot of fun the way Galaxy Quest is: a little goofy, a little serious but not taking itself too seriously, and filled with a fondness for the source material that gives it weight without weighing down the story. It's short enough to be read in one day, which is something a lot of books right now can't claim, too. It's also a throwback to pulpy paperbacks from the 50s and 60s, updated with a vast and self-aware knowledge of all the things that have happened in the genre since then. The knowledge conveyed feels personal and full of fondness, rather than just a database to pull from, and that fondness for the conventions of a space-based political adventure story goes a long way toward pulling it off, making The Absconded Ambassador fly along with blasters out even when the characters don’t.